Our Chapter was chartered in 1997. 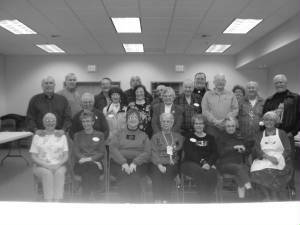 In 2006 Northern Lights has over 40 members and over 20 RV's involved in our Chapter. We meet monthly. During the summer we like to get out as much as possible. Our members like to explore Alaska's back country on their ATV's. Winter Meetings will be at 2 p.m. at the Wasilla Bible Church, 1651 W. Nicola St. accross from SBS. Potluck will follow the meeting. Potluck at 5 p.m., meeting to follow. Camping outings are Friday & Sat. You may if you wish go to the listed camping site on Thur and you may stay until Sun. or Mon. Our chapter also raises money to donate to Dogs for the Deaf. We do various community projects such as campground cleanups. We also collect pull tabs to support the Ronald McDonald House for Children. Please come and visit our Chapter. We would love to share some of the fun that we have in the Alaska outdoors. Contact Mel Bouwkamp (907) 376-7719. Northern Lights Chapter of the Good Sam Club is located in the Mat-Su Valley north of Anchorage. Please come join us for lots of outdoor fun.